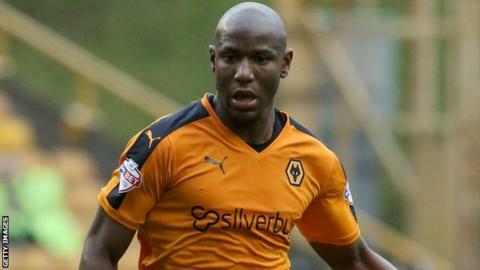 Wolves striker Benik Afobe says he was "crying in his car" with happiness after rejoining the club on loan from Bournemouth on transfer deadline day. Afobe scored 23 goals in 48 games for Wolves in his first spell at Molineux from January 2015 to January 2016. But the 24-year-old found the net just once in 22 for Premier League club Bournemouth this season. "I was on, then off, then on, then off, then on again with 20 minutes to go, so it was stressful," he told BBC WM. "I've had two serious career-threatening injuries in football before, but that six hours was probably the most difficult of my life because that's how much I wanted to come back to Wolves. "I think I've played one 90 minutes this season in the Premier League, so it's been tough for me mentally but I've got good people around me and for me to have come back here it meant a lot. "I was in my car crying when they told me the deal was on with 20 minutes to go because I knew there was no going back now in the sense of them cancelling or the deal not being on again." Afobe also thanked Cherries manager Eddie Howe, who Afobe said didn't want the move to happen, despite only giving him one Premier League start since the beginning of November. "When I said I want to go back he kept saying no, but he rang me and said I didn't want you to go but because you've been a good lad I wanted to do what was best for you," Afobe said. "They say nice guys don't win, but then sometimes they do, so I'm just thanking him and Bournemouth for letting me come here."